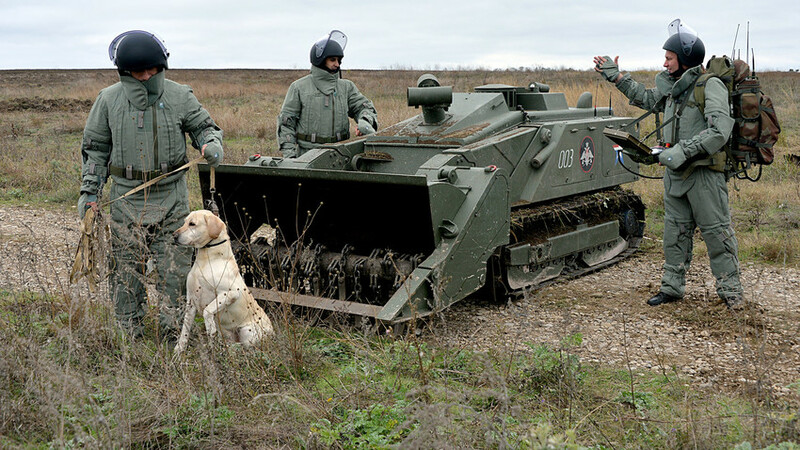 Mine clearance specialists of the engineering corps, with a dog trained to detect mines, near the remote-controlled Uran-6 robotic system during the removal of explosive objects from the agricultural land. Russia is in the process of upgrading its Engineer Forces with robotized technology, some of which was tested during the country’s campaign in Syria. More than 6,500 hectares of land was raked through by special machines, which destroyed 100,000 mines and bombs in the process. Military experts claim these armored machines can survive a 10-kilogram TNT explosion and continue operating. They were first used to demine Palmyra in 2016 and then Aleppo following the city’s liberation. The “Uran-6” travels at a speed of seven km/h with it’s mine plow outstretched before it. The operator is safely positioned 50 meters away. Thanks to its caterpillar tracks it can climb boulders and walls up to one meter high. The “Uran-6’s” younger brothers - “Sphera” and “Skarabei” - also participated in demining residential neighborhoods and the most inaccessible areas in Syria. “Before, sappers and canine teams were sent into areas difficult to access, where large technology could not pass. But now the armed forces have small sapper scouts that survey each area place in its entirety so human lives are no longer put at risk,” Dmitri Litovkin, former Izvestia newspaper military analyst, told Russia Beyond. He also said these machines were able to reach underground tunnels and wells in Syria. “Sphera” is named after its appearance: It looks a little like BB8 from Star Wars – a small sphere with four cameras that rolls along the floor and sends pictures of its surroundings to its operator in real time. “Skarabei” resembles a remote-controlled toy car, but it in reality it saves lives. It’s operator can stand up to 250 meters away. You can find more about new technologies meant to prevent casuals here.